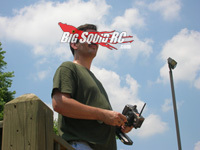 ASK Cubby 05.07.2014, Version- More Well Thought Out Questions, Much Less Meaningful Responses « Big Squid RC – RC Car and Truck News, Reviews, Videos, and More! “Hey there…Just looking for some advice/ Opinions/ Guidence…. I’m looking to buy a new Electric Monster Truck…I have been looking at the HPI Savage XS and the Vaterra Halix….what are your thoughts on these two and what would you recommend? I’m a newbie and have a large grassy park across from my house with a skate park and a couple of Dirt fields for softball games. Also, what Batteries would you recommend for long run time and what charger would you recommend for good fast charging? Cubby- Oh yes Santiago, the age old question, “which one should I buy”. I found your letter interesting in the fact that you are stuck between two vehicles that have many things in common, yet are sooooo much different. Both the Vaterra Halix and the HPI Savage XS are 4wd, monster trucks, and have enough raw, unadulterated, brushless power to do all the crazy stuff you see in the videos on U-tube. And… most importantly, both are capable of providing lots of good times. However, just like everything else on the planet, they both have up and down sides. The biggest downside to the Savage is its size, it’s somewhat smaller than the Halix. This can be a downside when attempting to blast over extremely rough terrain. On the plus side, we’ve found the Savage XS can take some serious beating without breaking. Because of its size, the Halix can blast right over big dirt clods that would be tough to even get over with the XS, but you’ll have to do some upgrades to keep the Halix from breaking if you bash it hard. Enough of the mumbo jumbo, which one should you buy? That’s up to you, but I would buy the Halix. It’s bigger, it has AVC, and most people are gonna mod-out their scoot to bulletproof it anyways. There is your answer, now go cut the check. Oh and… for a battery and a charger, we had good luck with the gear we used in our Halix Review, which was a Dynamite 3S 5200 and Hitec X1 Touch. Do you have a part number for the Kimbrough servo saver for the Carisma m40dt? Cubby- What, seriously? Google search doesn’t work on the planet you are from? Hey Aaron, welcome to BSRC, where everyone gets their balls busted from time to time. Ok, so maybe you haven’t been in the hobby since the Earth cooled like us. Kimbrough Racing Products has made rock solid servo savers for years. They come in a few different styles and mount right to the output shaft of your servo. The spring inside takes all the abuse, while your servo lives on to fight another day. During our Carisma review we broke the stock servo arm and just happened to have a Kimbrough #121 in our pit box, we popped it on and the truck was up and running in less than 2 minutes. We highly recommend Kimbrough servo savers if you want to bash hard without blowing up the gears inside your servo. That’s it ya lunatics, shoot me your questions, wedding announcements, dirty secrets, and ex girlfriend pictures to Cubby at BigSquidRC dot com. If I pick your letter to hit our front page you’ll get something cool and free.